Arsenal midfielder Aaron Ramsey, assess Mesut Oezil performed very well in his first game, against Sunderland at the Stadium of Light on Saturday (14/09/2013).Oezil join Arsenal on 2 September 2013 for a fee of 43 million pounds, making it the most expensive player of all time the Gunners. He immediately got a chance to play as a starter against Sunderland. The match ended 3-1 to Arsenal. While the Sunderland goal Craig Gardner scored from the penalty spot in the 48th minute, Arsenal created Olivier Giroud scored (11) and Ramsey (67, 76). 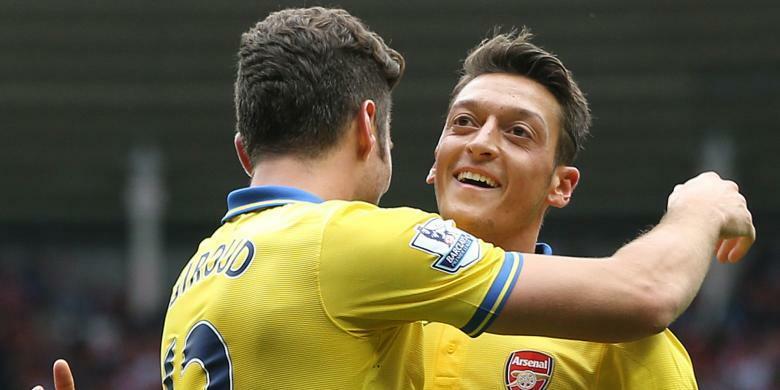 Giroud scored a fruit bait Oezil. “He (Oezil) is a fantastic player and a prize for the team. He will create many opportunities for us,” Ramsey said as quoted by Arsenal’s official website. “I think he has shown all of his abilities. Wonders He has in his left foot. Caressing him like a ball and let the bait looks looks so perfect and precise step toward any player,” he added. Related two goals against Sunderland, Ramsey said, “We conceded very quickly in the second half and the fans continue to support them. They were able to pressure us with crosses into the penalty box. So, we have to be patient. But the goal finally arrived in the last minute and I think we deserved the victory, “he said.